Best remembered for their early work with Tommy Dorsey, the Pied Pipers originally consisted of eight members, seven men and one woman. The octet was formed in Los Angeles during the mid-1930s, an amalgamation of two groups, the Rhythm Kings and the Esquires, plus Jo Stafford. Their stylish harmonies proved appealing, and they began working at local radio stations and recording for Hollywood soundtracks. They soon attracted the attention of Dorsey arrangers Paul Weston and Axel Stordahl. In 1938, Weston persuaded Dorsey to give the Pied Pipers a spot on the Raleigh-Kool Show, a popular radio program. All eight members piled into two cars and drove to New York, with no promise of work other than one shot on the radio. The show went well though, and they were signed to appear for ten weeks, but just as everything seemed to be going their way, disaster struck. During their second program, the sponsor heard them for the first time, didn’t like them, and promptly fired them. The Pipers remained in New York for seven more months, landing only one job the whole time from which they made $3.60 each, though they did record four sides for RCA Victor during their stay. Returning to Los Angeles, the group lost four members to regular jobs on the way. The remaining members (Stafford, her then-husband John Huddleston, Billy Wilson and Chuck Lowry) struggled to make a living and were on the verge of calling it quits when, in 1939, they received an offer from Dorsey to join his orchestra. Shortly after, Wilson was replaced by Clark Yocum, who had previously sang and played guitar for Mal Hallett’s orchestra. With Dorsey, the Pipers finally found success. Stafford was featured solo on several occasions, and the group backed Frank Sinatra on many of his early numbers. The Pied Pipers remained with Dorsey until Thanksgiving Day 1942, when Dorsey exploded at one of the members, igniting an argument with the whole group, who promptly quit. They were immediately hired by three radio stations. Huddleston left the group to join the service that same year. He was replaced by Hal Hopper, who had been one of the original eight members. In 1943, the Pipers were signed by Johnny Mercer to his newly-formed label, Capitol Records. 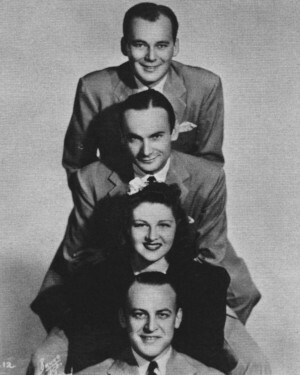 Stafford left the group in 1944 to pursue a solo career and was replaced by June Hutton, half-sister of bandleader Ina Ray Hutton and a former member of Charlie Spivak vocal group the Stardusters. 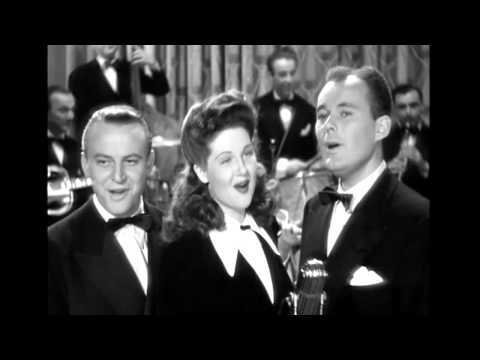 The Pipers went on to record several hits during the remainder of the 1940s, including “Dream,” their first million seller. In 1947, Huddleston sued the group plus ex-wife Stafford for breach of contract. When he had entered the service, his spot in the quartet was to be guaranteed upon his return, but he was not allowed to rejoin when that time came. The group’s popularity began to wane in the 1950s, and the members drifted off into personal pursuits. Hutton recorded several solo albums for Capitol, backed by husband Alex Stordahl’s orchestra. Hopper went on to play a regular role as Corporal Clark on the television series The Adventures of Rin Tin Tin. He also appeared in several films, including the classic Beau Geste and the Ann-Margret vehicle Kitten with a Whip. Hutton passed away in 1973, Hopper in 1970. Jo Stafford in 2008. A group bearing the Pied Pipers’ name still tours today.